The camp has a lot of recreational activity options. The best feature of the camp is that you can play in the stream in a picturesque and rugged setting. Don’t forget this is a stream not the Ganges.... so you can soak yourself without worrying about the strong water currents. Rishikesh is very popular for rafting on the River Ganga. Season: October to June. 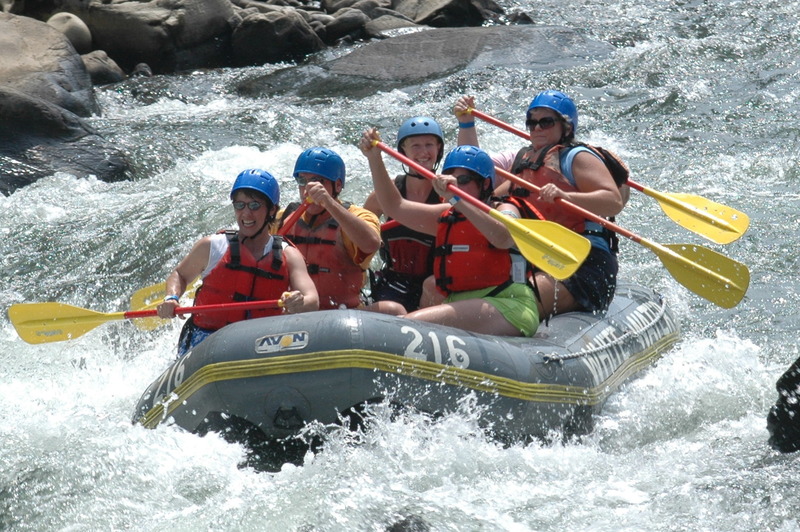 The rafting will go on for several kilometres, and the path is interspersed with rapids, ranging from Level 1 to Level 5, in order of difficulty. You may jump into freezing water from a cliff! Yes, it sounds crazy but this is one thing which everyone can brag about back home, of course you are wearing a life jacket and a helmet but still to jump from so high into the Ganga which is a little murky and the bottom can't be seen, it's not like jumping into a swimming pool where one can see the bottom when the water is static. There are a lot of soft treks in this region. 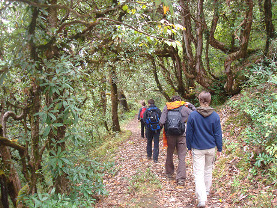 Trekking along the Phoolchatti waterfall is something we would definitely suggest. This is an optional thing as some people love to walk in nature and do a bit of bird watching and some prefer to be at the camp and relax as they are already tired with the activities they have done. The group is taken to a spot where there is a cliff drop, experts with proper equipment who setup the gear first and then, one by one, everyone comes down. It's all about trusting your gear and following the instructions and then it's a lot of fun. A nearby destination offers thrill for the adrenaline rush seeking youth. You may visit a cantilever platform built over a rocky cliff over looking a rocky river Hyule, a tributory of River Ganga. Jump with rubber chords tied to your ankle and feel the adrenalin rush like never before. 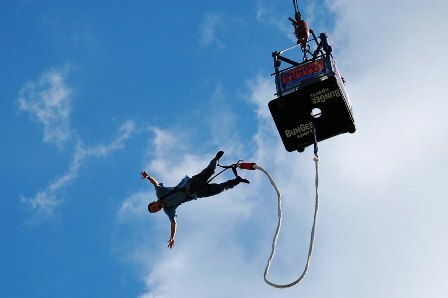 Bungee Jump Height - 83 metres. Jeep Safari in Rajaji National Park; Nature /Bird watching walks along the stream. Cycling. If you wish to flush your lungs with fresh air, we can arrange a cycling trip for you along an incredibly picturesque track. Sports n Games. Volley Ball, Badminton and lots of other recreational activities like Carrom etc.